Universal Adult Franchise - Time for a rethink? HomePoliticsUniversal Adult Franchise - Time for a rethink? 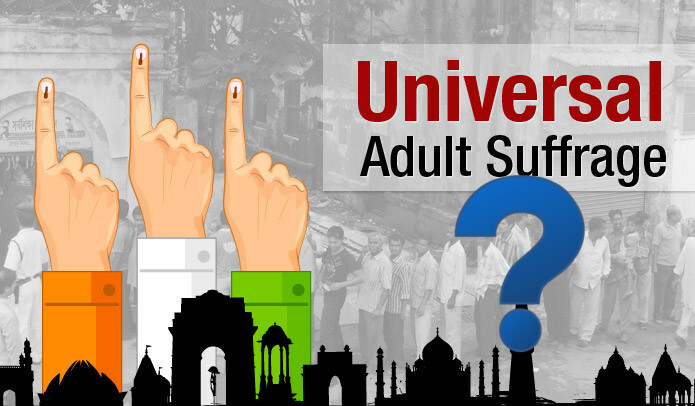 Universal Adult Franchise - the guarantee of the fundamental right to vote given by the constitution of a democracy to each and every one of its citizens. Universal suffrage is a core principle in any proper democracy and has been enshrined in India's constitution since the day it was adopted in 1950. It gives each and every legal citizen of the country - irrespective of caste, creed, color, religion, ethnicity, gender or any other factor - the right to vote, and thereby, the right to participate in the electoral process and steer the country's governance. It is undoubtedly a powerful tool to make the voice of each and every person heard and allows the common man to speak truth to power. The architects of our constitution, and thus our democracy, envisioned universal voting rights precisely as that - a powerful non-discriminatory tool placed in the hands of the citizens of the country. After several centuries of monarchies and colonialism, it was a radical idea, one which even the West was grappling with at the time of India's independence. Our constitution makers saw a democracy where everyone was equal and the country moved forward taking in all the different perspectives of every citizen and coming up with representatives who was acceptable to all. It was a vision of progress and betterment of the entire nation leaving no one behind in the process. Unfortunately, this often does not seem to be the case. A very uncomfortable truth in Indian politics is what is commonly known as 'poll promises' - contesting candidates offer various incentives to the masses if elected to power. A case in point is our current PM Narendra Modi's 2014 promise of putting Rs. 15 lakh in the hands of each and every citizen if voted to power. This wild statement encapsulates what poll promises have come to represent - blatant lies that the majority of voters themselves do not believe will be carried out. Farm loan waivers are another very common poll promise along with better pensions, better employment opportunities, giveaways, and more recently, city renaming and reservation granting. Though some of these may be made with good intentions, a vast majority merely remain on paper as promises. No political party can claim to be free of this shoddy gimmicky form of politics. The problem with such promises is that they never are a solution. If carried out, such measures may provide temporary relief to a problem faced by the citizens, but it does not address the root issue behind it. There are little long-term benefits to these short-term dollops of magnanimity by the powers that be. Unfortunately, it often are these very dollops that decide which way an election swings. Humans have a notorious affinity for short-term benefits and being myopic to the bigger picture, and it is precisely this that populist leaders and demagogues exploit to their benefit. By whipping the masses into a frenzy right before elections, fuelled both by appealing to inherent prejudices and popular desires, they capture power and thus exploit the very system meant to give everyone the best choice possible. It is common knowledge that short-term interests often do not serve long-term interests. It is also a well-known principle in economics that interests of an individual need not be in line with the interests of the population a whole. For example, in the case of a food shortage, individual interest dictates that we hoard as much food as possible to tide over the crisis. Everyone following this line of thought, however, would be disastrous; what would be good for society in such a condition of a shortage is the exact opposite of what is good for an individual - rationing of food. The same applies when electing a candidate - the one who seems good for the individual (vis-à-vis poll promises and popular support for morally questionable intents) may not be good for the society as a whole. The principle seems simple enough, however implementing it in today's democracy, where majoritarianism and political polarisation are the catchphrases, seems distant. And it is here that a common test before granting of voting rights to a citizen of legal adult age comes into the picture. Rather than growing into the right when he or she is of appropriate age, the citizen must earn it by successfully completing an examination where his/her ability for rational thought and IQ is tested. In his strong defence of universal adult franchise, Dr B R Ambedkar had laid to rest the argument of illiteracy by stating that “...every man is intelligent enough to understand exactly what he wants. Literacy has not much bearing on this point; a man may be illiterate, none the less he may be very intelligent.” Thus basing literacy as a basis for voting right is out of the question. However, rereading the words of one of the prime architects of the constitution, we see that he himself stated that intelligence is a prerequisite to voting right. Standard IQ tests used the world over today are literacy free - that is they test your ability for rational thought, and thus intelligence, without the use of a language. Most such tests are graphical and intuitive in nature and do not require any prerequisite knowledge to complete them. Such a test would thus be a good measure of the degree of rational thought of an individual, and could be used as a yardstick to grant voting rights. When an Indian citizen is 18 years of age, he/she can drive a vehicle, provided he/she has passed the required driving test. In the same vein, to drive the political landscape of the nation, it seems no stretch to require him/her to pass a voting rights test. Such a test is of course not a one-shot panacea for all the problems afflicting our society and democracy. It does not address many deep-seated problems like bigotry, corruption, nepotism etc. But it does offer the possibility of more responsible politics in the country - one that is driven more by agendas of development and progress than by bursts of populism during election time. People earning their right to vote might also make them more responsible voters, and value the power of the tool they wield. There is thus the glimmer of hope that such move could lead to a much cleaner political landscape more in line with the vision of our founding fathers, one with consistent policies of development which takes everyone along. And it is a logical and practical solution that can redefine election promises and accelerate the growth of the country. For, what is the use of having some of the best minds in the world in our top bureaucracy if the priority of the policymakers is statue and temple construction? People who have rather low scores in these so called standard IQ tests may still be able to make logical decisions. So I believe that the rationality checking test mentioned here would be psychological in nature. A driving test is skill based and such skills don't really change much. Whereas psychologies really do.So in the event of such a test being introduced,unless one has to take the test before each election(impractical-it would cause several people to sit at home and choose not to take so much trouble to vote), it could not really work out. Another something worth mentioning here is that nearly everyone is vulnerable to " promises" irrespective of whether or not they've passed the eligibility test.It is part of a hope they have for bettering themselves, part of what one can call human-ness.Hence,even if there were a test to filter out voters,the 'filtered' voters will still display the same mentalitities. There is also the question of who gets to evaluate a person's fitness to vote?Everyone has biases in some way or the other,and even if it is machine evaluated,the algorithm would be made by a humans and stands the chance of being rigged,even otherwise.